Boston Dynamics is a robotics company that is now part of Google, and by the looks of it, it is at the cutting edge when it comes to walking bots. 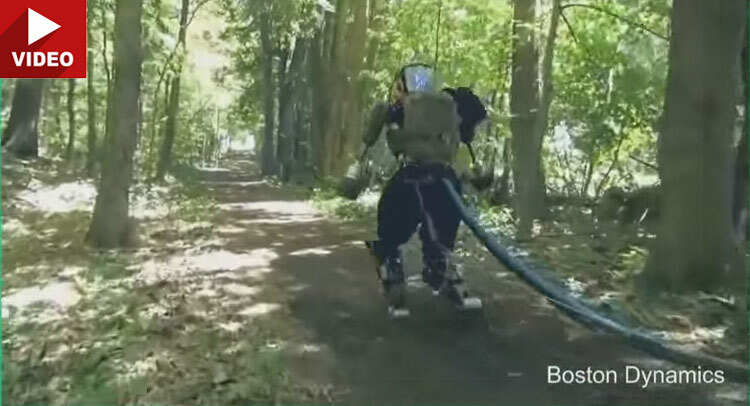 The one shown in the video below walking in the forest may look like a guy fending off an imaginary swarm of bats, it paces with sure-footedness and decent speed and is probably the one of most impressive such robots we’ve ever seen! They also have a four-legged robot called Spot, which is a little less creepy than the upright walker. The latter conjures up doomsday-Skynet scenarios for some, but it really shouldn’t be that way. Why not imagine that Google is really doing all this work to create autonomously walking piggyback ride robots to help disabled people or just bypass the burden of walking for the lazy ones out there? Same goes for Spot – possibly the very early prototype for a robot you will be able to ride. The first of the videos posted below is an excerpt from the much longer second one. The people talking are Russ Tedrake, Director, Center for Robotics, MIT Computer Science and Artificial Intelligence Lab, Sangbae Kim , of the MIT Biomimetic Robotics Lab and Mick Mountz, the founder of Kiva Systems, now called Amazon Robotics.